You can join if you live, work, visit, or study in Surrey. You can join as a visitor if you're in Surrey for a week or more. If you have an illness or disability, Library Direct can come to you. You'll receive a library card, which you can use in all Surrey libraries. There's no age limit – join with your baby or toddler and get our special Pebble card. If you have an email address and live in Surrey, you can join online in minutes. Choose a home library: Select 'eLibrary' if you only want to access our eBooks and eAudiobooks. Fill in your details: If you're under 16 years old, you'll need details of your parent, guardian or carer. Choose a PIN: This is your password for logging in to our various library services. Your library card will then be sent to you in the post, and your new membership number emailed to you. In the meantime, you'll be given a temporary borrower number, which you can use to start reserving physical books. If you've not heard from us within two weeks, please contact us. You'll now have 'virtual membership' (if you're over 16 years old). This allows you to borrow two items at a time, and access eBooks, eAudiobooks and our online reference shelf. Virtual membership can be upgraded to full membership at any time simply by taking your card to a library. 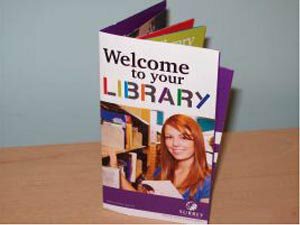 If you live, work, visit, or study in Surrey, you can join in person at your local library. Adults: Something with your name and current address on (e.g. driving licence, bank statement or utility bill). Under 16s: A parent or guardian, and an official document with your family name and current address on. Visitors: If you're in Surrey for a week or more, you can join as a visitor. All you need is a form of identification. If you're unable to get to a static library because of illness or disability, we can arrange for books and audio material to be brought to you on a regular basis by a volunteer. For more information, please see our web page: Libraries Direct Home Service. Alternatively, you can apply for the Surrey Libraries Open Ticket Adult (PDF). For more information on libraries, please see our web pages: Terms and conditions for libraries and Libraries policies and procedures.